On Staple Remover this week I am going to take a look at card draw in black. 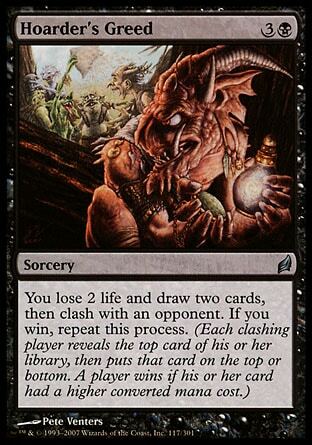 When someone is running black in their deck they will often be packing a couple of tried and true card draw staples. Maybe you’ve heard of them before? Well if you are sick of casting Necropotence and Phyrexian Arena, this article is for you. I’ll be covering some alternatives to the expected 3 drop enchantments we all know. 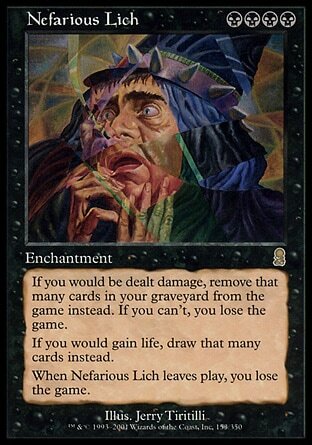 In a 40 life format there is no debating the brutal effectiveness of Necropotence. 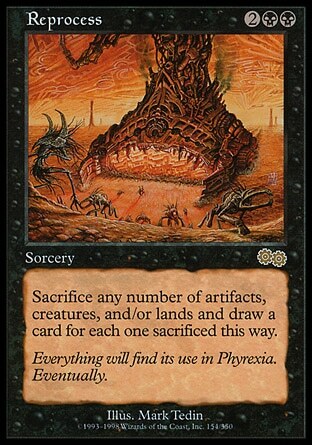 Phyrexian Arena isn’t nearly as powerful, but it is a common staple that is seen very often. I certainly don’t think either card should be banned, but I do think it adds an extra challenge to deck building and winning in general if we mix it up a little. Tutoring for Necropotence, drawing a pile of cards and then playing your wincon can get pretty stale and moldy, so why not draw your cards with something more.. unexpected. Infernal Tribute – Hey look it costs the same as Necropotence and its an enchantment! The similarities pretty much end there since you are going to have to utilize this quite a bit differently. 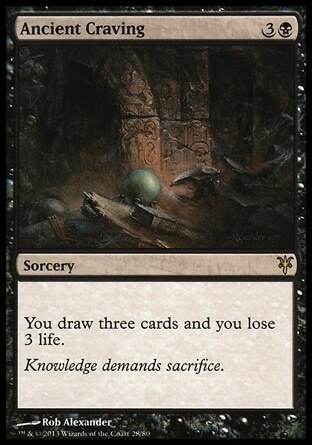 Paying mana for card draw, plus sacrificing a permanent may not seem that effective since you are essentially blowing up a card in play to gain a card in your hand. 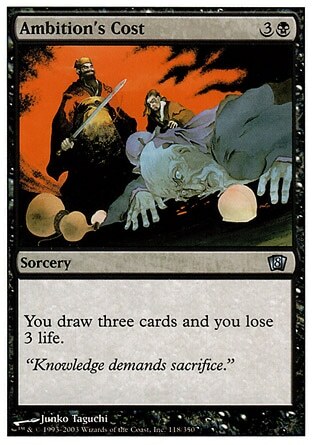 However, a sacrifice outlet that also nets you cards is pretty strong. Feel free to junk those permanents you stole from your opponents and anything else you want to see hit the yard. Unfortunately the errata means we can’t sacrifice tokens, but there are plenty of ways to build around this. Cathodion seems like it would be a fun card to pair up with the tribute. Of course zombies love to play in the yard and then come back for more as well. 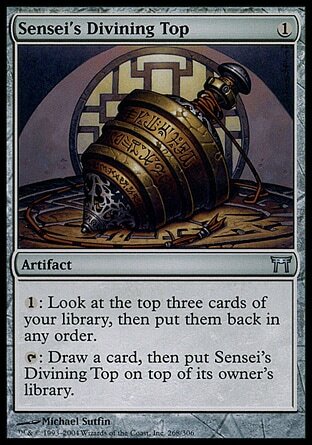 Greed – If you don’t want a sac outlet with your card draw, Greed is a pretty straightforward repeatable card draw tool. One advantage it does have over Necropotence is the ability to pick through cards one by one, instead of having to buy them all in bulk. When you are starting at 40 life the 1 mana and 2 life cost per card isn’t going to send you to the poor house too quickly. The worst part about this card is the art, you either get a Phil Foglio Santa Clause eating a stack of chicken nuggets or some dude spread-eagle on a pile of peanuts. Get this one altered. 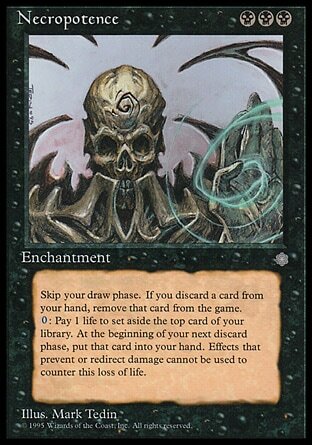 Phyrexian Etchings – All you cumulative upkeep lovers out there can feast your eyes on Phyrexian Etchings. Now that cumulative upkeep uses age counters, we can use something like Vampire Hexmage or Hex Parasite to reset the age clock. However, the most effective tool to use with Etchings is probably going to be a bounce effect. This will effectively allow you to reset the card and also avoid the penalty for hitting the yard. Something like Cloudstone Curio could fit that bill. 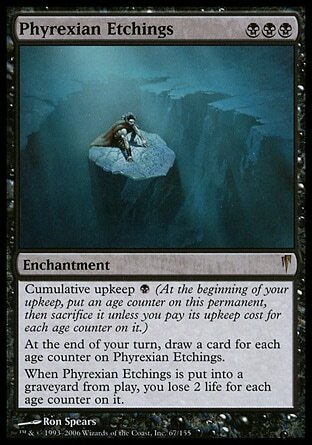 The problem is a lot of the best bounce effects are in blue and if you are in blue, you probably don’t need to run Phyrexian Etchings for your card draw. 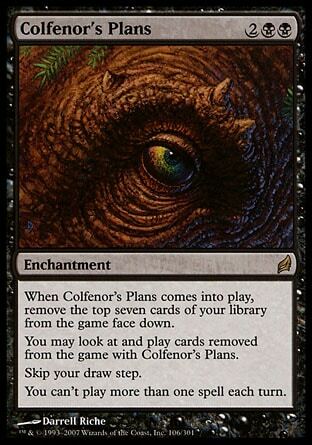 Colfenor’s Plans – So its not technically card draw, but this is a decent way to dig for cards. The big treefolk’s plans will need some level of support to make it really work well for you. Due to the 1 spell per turn clause, you will definitely want a way to bounce it back to your hand or sac it once it’s outlived its usefulness. However, don’t forget, you get to cast 1 spell per turn, not just your own turn. 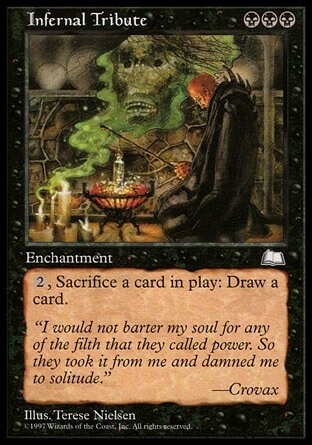 Its a great card to sacrifice to your Infernal Tribute to draw even more cards. If you have a way to bounce it, you get to dig for 7 cards all over again. If you have a method to stack the top of your deck, this card is going to shine, despite the steep drawbacks. Gravestorm – There sure are a lot of BBB enchantments for card draw aren’t there? I like the versatility you can get from Gravestorm. 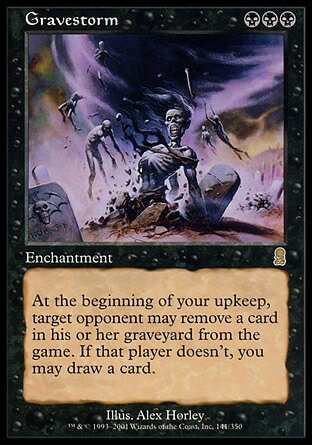 If you are running other graveyard hate, you can target players with no cards in their yard to get your draw, or its a free repeatable effect to thin out cards from peoples yards. Graveyard hate is never a bad thing to have. Lich – When I first started playing Magic the first piece of advice someone gave me was “Never play Lich, never, you don’t ever want to play Lich.” I’m here to pass that advice along to you. Just don’t even try it. I’m lumping Oath of Lim-Dul in with these as well. 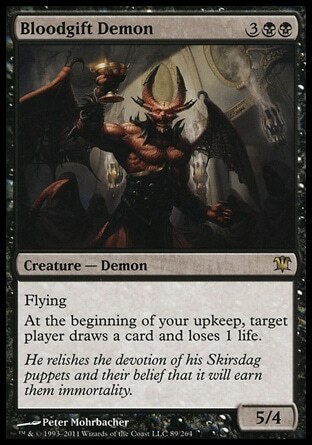 Bloodgift Demon – Its a Phyrexian Arena that swings for 5 in the air. If the opportunity presents itself you can target an opponent with the damage and card draw trigger for the ultimate F.U. finish. I really like this guy and I run him in multiple decks. I’m never disappointed to draw it. 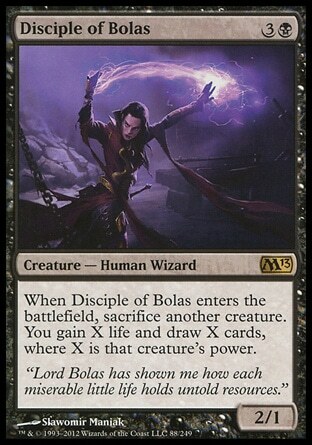 Disciple of Bolas – Sure, you have to sac a creature to gain those cards and life, but we are in black, creatures are expendable. There are a lot of situations where 6 fresh cards in your hand and 6 life are going to be much more valuable than that big flying demon you had that was just getting chump blocked. This card is growing on me the more I play it. 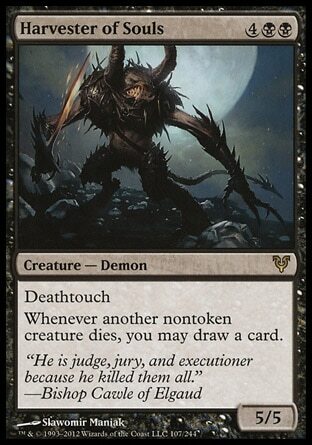 Graveborn Muse – The muse is very similar to Bloodgift Demon, just without the more imposing body. However, if you are running a few other zombies or especially if your general is a zombie (there are 16 last I checked), the muse is going to scale well for you. I personally run it in a zombie tribal deck, but you definitely don’t need that many zombies, in fact it works just fine with only a couple zombies out. Harvester of Souls – Yet again, we are in black, so things should be dieing with some regularity. Additionally, a 5/5 body with deathtouch is going to do some damage on its own. Whether you are sacing creatures every turn or picking off opposing beasts, Harvester of Souls is going to do some work for you. Hoarder’s Greed – Maybe you just stacked the top of your deck with Insidious Dreams or maybe you run a higher density of high CMC spells. If you can combine a little bit of deck stacking, you can really go long with Hoarder’s Greed chaining some card draw together. 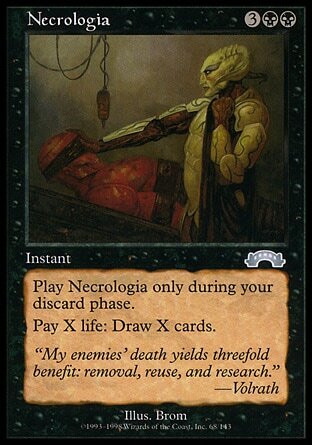 Necrologia – The Exodus printing has Brom art, so thats a big feather in this card’s cap. Necrologia is basically going to be a one shot Necropotence. 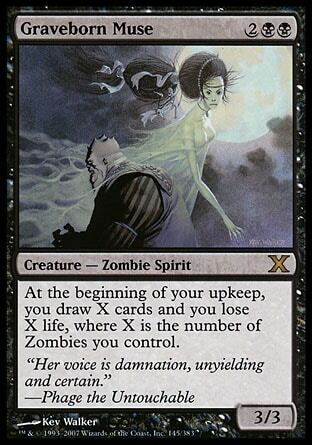 The upside is you aren’t going to have to exile excess cards instead of discarding them, so its a card that can help feed your graveyard as well. 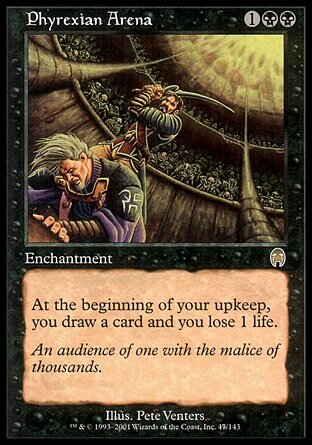 The big drawback here is if the spell gets countered, since paying the life is part of the cost. Just make sure to tell everyone not to counter it, and you will be good! 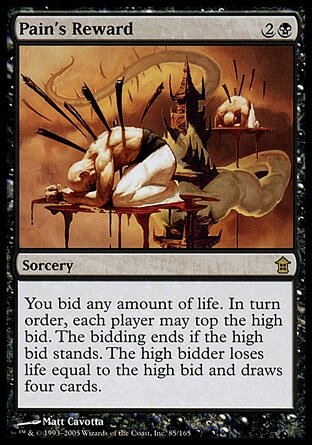 Pain’s Reward – Any card that involves bidding is my kind of card. 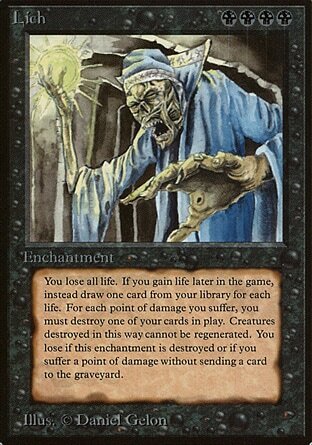 This might backfire and an opponent will get to draw the cards off of your spell if someone after them in turn order wimps out on paying life. To me, the big selling point is that getting to bid on an effect is not something you get to do every day. Reprocess – Are you sick and tired of your permanents. Have they become tedious and boring? Sac them! With Reprocess you can take those boring old permanents and exchange them for what’s in this box! It could be anything! 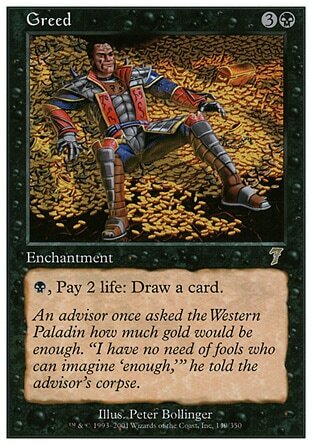 Also, unlike Infernal Tribute, we can sac a huge lot of tokens for maximum reprocessing power. 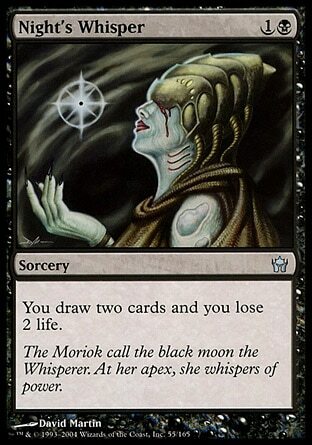 Night’s Whisper/Sign in Blood – I am a big fan of both of these cards. You get more bang for your mana than with Craving/Cost and Night’s Whisper is even pretty splashable with its mana cost. 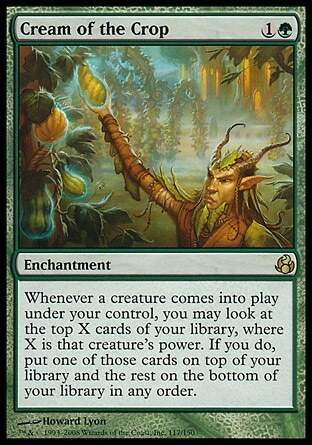 If you are running creatures with even lower powers, Cream of the Crop is going give you some serious digging, superior to even top. Give the Crop a chance and drop that Top.